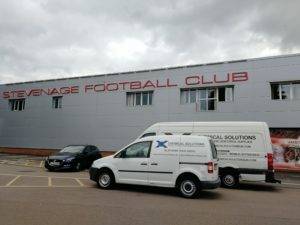 This past weekend we cleaned the toilet floors for one of our customers, Stevenage Football Club. We dont usually offer a cleaning service but as they are a valued client we were happy to make an exception. Because of the amount of traffic that comes in and out of the stadium on a regular basis, it is extremely difficult for them to carry out a thorough clean of the premises and have the toilet floors sparkling clean. Thats why they asked for our help. With the start of the new season fast approaching, they wanted to start with a bang and have their fans walk into a fresh looking stadium. With thousands of football fans coming in and out of the toilets every week, it doesnt take long for the toilets to become dirty and for the dirt to be ground into the floor. This can be extremely difficult to clean as the dirt will be stubborn to lift. A floor buffer is essential as it provides the power to break down the dirt whilst covering a large amount of ground. We also used a hand held floor scrubber in order to scrub the areas that the machine could not reach, such as the edges of the walls, around the toilets and in the corners. A strong floor cleaner is also used to cover the floor before we use the buffer, in order to help break down the hardened dirt. We used our very own floor acid which has been diluted to the correct measurement. Enough to break down the dirt but not be harmful to the floor and its surroundings, or to ourselves. Once the floor has been scrubbed using the buffing machine and our hand held floor scrubber, we then washed the floor with warm water in order to rinse away any remaining acid and dirt. With the floor now soaking wet, we used a floor squeegee to brush out the excess water so that the floor can be left to dry. As the floor is drying, we used 14oz exel mops to help speed up the process but also wipe away any remaining dirty or watery streaks. After this process the floor looked nice and sparkling clean!